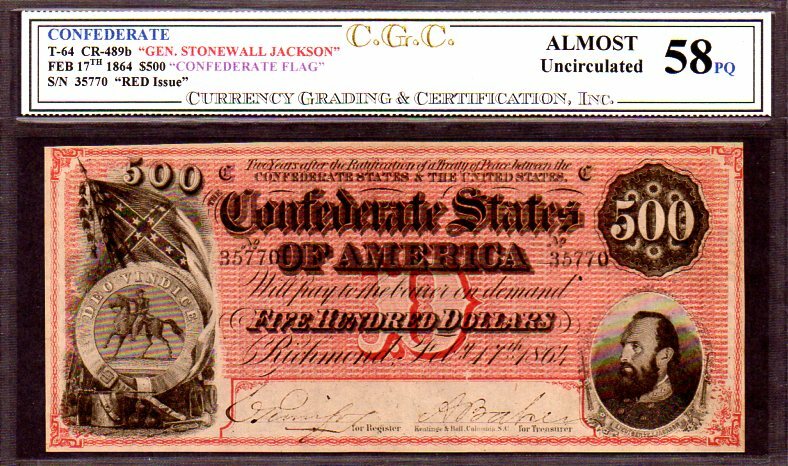 CONFEDERATE T-64 CR-489b FEB. 17th 1864 $500 PMG 58EPQ - 2nd FINEST KNOWN AND ONLY the 2nd PIECE CGC HAS EVER GRADED OF THIS VARIETY!!! "RED ISSUE" 100+ TIMES RARER THAN THE PINK ISSUE. 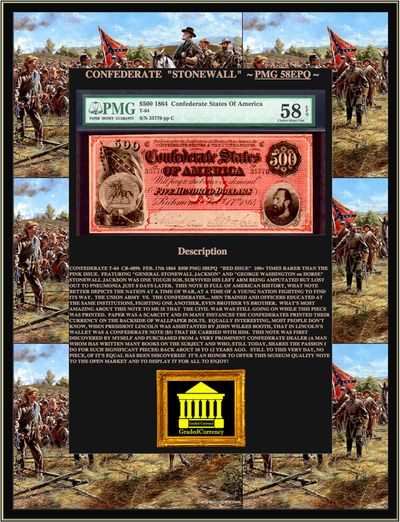 FEATURING "GENERAL STONEWALL JACKSON" AND "GEORGE WASHINGTON on HORSE" STONEWALL JACKSON WAS ONE TOUGH SOB, SURVIVED HIS LEFT ARM BEING AMPUTATED BUT LOST OUT TO PNEUMONIA JUST 8 DAYS LATER. THIS NOTE IS FULL OF AMERICAN HISTORY, WHAT NOTE BETTER DEPICTS THE NATION AT A TIME OF WAR, AT A TIME OF A YOUNG NATION FIGHTING TO FIND ITS WAY. THE UNION ARMY VS. THE CONFEDERATES.... MEN TRAINED AND OFFICERS EDUCATED AT THE SAME INSTITUTIONS, FIGHTING ONE ANOTHER, EVEN BROTHER VS BROTHER. WHAT'S MOST AMAZING ABOUT THIS NOTE TO ME IS THAT THE CIVIL WAR WAS STILL GOING ON WHILE THIS PIECE WAS PRINTED. 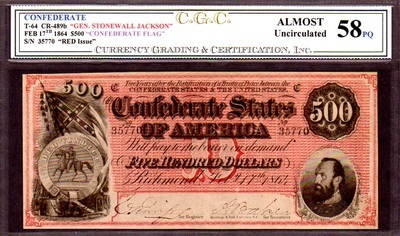 PAPER WAS A SCARCITY AND IN MANY INSTANCES THE CONFEDERATES PRINTED THEIR CURRENCY ON THE BACKSIDE OF WALLPAPER BOLTS. EQUALLY INTERESTING, MOST PEOPLE DON'T KNOW, WHEN PRESIDENT LINCOLN WAS ASSISTANTED BY JOHN WILKES BOOTH, THAT IN LINCOLN'S WALLET WAS A CONFEDERATE NOTE ($5) THAT HE CARRIED WITH HIM. 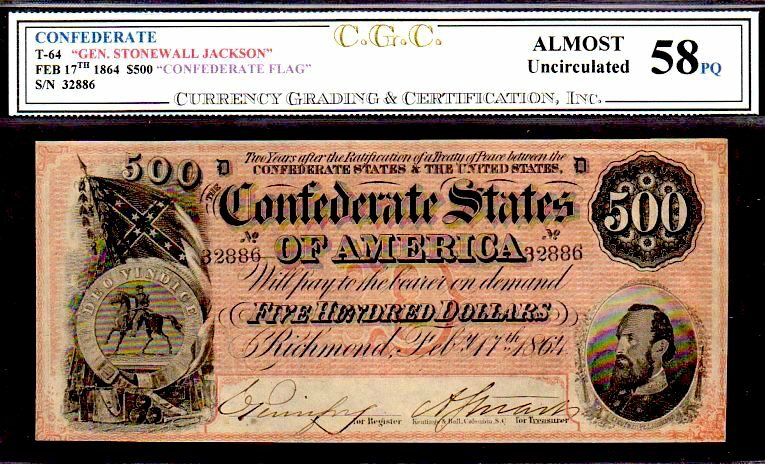 THIS NOTE WAS FIRST DISCOVERED BY MYSELF AND PURCHASED FROM A VERY PROMINENT CONFEDERATE DEALER (A MAN WHOM HAS WRITTEN MANY BOOKS ON THE SUBJECT AND WHO, STILL TODAY, SHARES THE PASSION I DO FOR SUCH SIGNIFICANT PIECES) BACK ABOUT 10 TO 12 YEARS AGO. STILL TO THIS VERY DAY, NO PIECE, OF IT'S EQUAL HAS BEEN DISCOVERED! IT'S AN HONOR TO OFFER THIS MUSEUM QUALITY NOTE TO THE OPEN MARKET AND TO DISPLAY IT FOR ALL TO ENJOY! 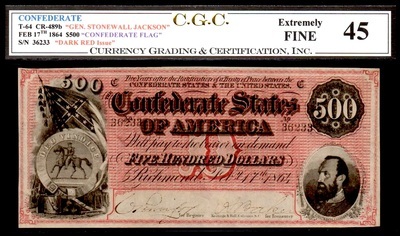 CONFEDERATE T-64 "STONEWALL JACKSON" CR-489b FEB. 17th 1864 $500 CGC 45 - "RED ISSUE" 100+ TIMES RARER THAN THE PINK ISSUE. FEATURING "GENERAL STONEWALL JACKSON" AND "GEORGE WASHINGTON on HORSE" STONEWALL JACKSON WAS ONE TOUGH S.O.B., SURVIVED HIS LEFT ARM BEING AMPUTATED BUT LOST OUT TO PNEUMONIA JUST 8 DAYS LATER. THIS NOTE IS FULL OF AMERICAN HISTORY, WHAT NOTE BETTER DEPICTS THE NATION AT A TIME OF WAR, AND OF A YOUNG NATION FIGHTING TO FIND ITS WAY. THE UNION ARMY VS. THE CONFEDERATES.... MEN TRAINED AND OFFICERS EDUCATED AT THE SAME INSTITUTIONS, FIGHTING ONE ANOTHER, EVEN BROTHER VS BROTHER. WHAT'S MOST AMAZING ABOUT THIS NOTE TO ME IS THAT THE CIVIL WAR WAS STILL GOING ON WHILE THIS PIECE WAS PRINTED. PAPER WAS A SCARCITY AND IN MANY INSTANCES THE CONFEDERATES PRINTED THEIR CURRENCY ON THE BACKSIDE OF WALLPAPER BOLTS. EQUALLY INTERESTING, MOST PEOPLE DON'T KNOW, WHEN PRESIDENT LINCOLN WAS ASSISTANTED BY JOHN WILKES BOOTH, IN LINCOLN'S WALLET WAS A CONFEDERATE NOTE ($5) THAT HE CARRIED WITH HIM. IT'S AN HONOR TO OFFER THIS HIGH QUALITY NOTE TO THE OPEN MARKET AND TO DISPLAY IT FOR ALL TO ENJOY! CONFEDERATE T-64 CR-489b FEB. 17th 1864 $500 RAW AU FEATURING "GENERAL STONEWALL JACKSON" AND "GEORGE WASHINGTON on HORSE" STONEWALL JACKSON WAS ONE TOUGH SOB, SURVIVED HIS LEFT ARM BEING AMPUTATED BUT LOST OUT TO PNEUMONIA JUST 8 DAYS LATER. THIS NOTE IS FULL OF AMERICAN HISTORY, WHAT NOTE BETTER DEPICTS THE NATION AT A TIME OF WAR, AT A TIME OF A YOUNG NATION FIGHTING TO FIND ITS WAY. THE UNION ARMY VS. THE CONFEDERATES.... MEN TRAINED AND OFFICERS EDUCATED AT THE SAME INSTITUTIONS, FIGHTING ONE ANOTHER, EVEN BROTHER VS BROTHER. WHAT'S MOST AMAZING ABOUT THIS NOTE TO ME IS THAT THE CIVIL WAR WAS STILL GOING ON WHILE THIS PIECE WAS PRINTED. 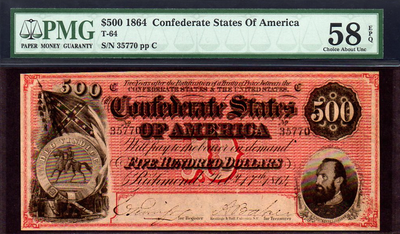 PAPER WAS A SCARCITY AND IN MANY INSTANCES THE CONFEDERATES PRINTED THEIR CURRENCY ON THE BACKSIDE OF WALLPAPER BOLTS. EQUALLY INTERESTING, MOST PEOPLE DON'T KNOW, WHEN PRESIDENT LINCOLN WAS ASSISTANTED BY JOHN WILKES BOOTH, THAT IN LINCOLN'S WALLET WAS A CONFEDERATE NOTE ($5) THAT HE CARRIED WITH HIM. THIS NOTE WAS FIRST DISCOVERED BY MYSELF AND PURCHASED FROM A VERY PROMINENT CONFEDERATE DEALER (A MAN WHOM HAS WRITTEN MANY BOOKS ON THE SUBJECT AND WHO, STILL TODAY, SHARES THE PASSION I DO FOR SUCH SIGNIFICANT PIECES) BACK ABOUT 10 TO 12 YEARS AGO. STILL TO THIS VERY DAY, NO PIECE, OF IT'S EQUAL HAS BEEN DISCOVERED! IT'S AN HONOR TO OFFER THIS MUSEUM QUALITY NOTE TO THE OPEN MARKET AND TO DISPLAY IT FOR ALL TO ENJOY!